The numbers appear to be in the Calgary Stampeders' favour ahead of Sunday's Grey Cup in Edmonton. Whether that's enough to end the team's losing skid in the championship game remains to be seen. The West Division champion Stampeders led the CFL in victories again this season, were second in points scored and allowed the fewest points of all nine teams. However, there is one statistic that will be a main talking point all week and it has made this year's Grey Cup a tough one to predict. Despite winning the West in 2016 and 2017, Calgary is 0-2 in Grey Cup appearances over those years. "I can shrug it off, you guys can't,'' Stampeders quarterback Bo Levi Mitchell told reporters after the West final. "Y'all will bring it up and I understand that. It's your job. This is a completely different team. It's not a rematch of 2016. It's not the same Ottawa Redblacks. Ottawa surprised Calgary 39-33 in overtime in 2016 in Toronto. 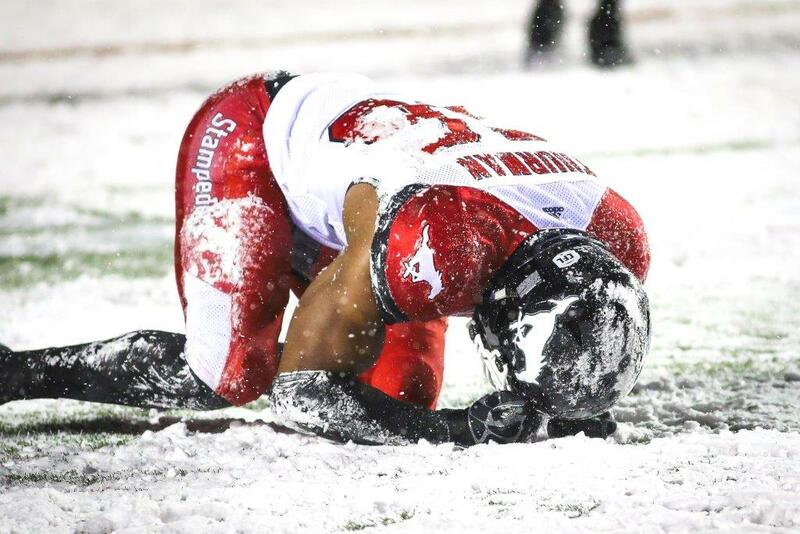 The Argonauts upset the Stampeders 27-24 in last year's championship at Ottawa. The Stampeders came through at home on Sunday with a 22-14 victory over the Winnipeg Blue Bombers. The Redblacks, who led the East at 11-7, took the division crown with a 46-27 win over the visiting Hamilton Tiger-Cats. It will be the fourth time that Ottawa and Calgary have met in the Grey Cup. The Stampeders beat the Ottawa Rough Riders 12-7 in 1948 and Ottawa took the 1968 game by a 24-21 score. The Stampeders last won the Grey Cup in 2014 when they beat Hamilton 20-16. Calgary swept the 2018 season series against the Redblacks with a 24-14 win in Week 3 and a 27-3 rout in Week 5. Bookies have installed the Stampeders as early four-point favourites with an over-under of 53.5 points. "Look at our roster, there's hardly anybody here that's been here for two years,'' Dickenson said. "There's been so much turnover. We've done it with totally different teams. We're not the same team. We may have had more explosive players, but we're still a damned good team. The weather forecast looks rather appealing for a late-November date at Commonwealth Stadium. A high of minus-6 C is expected with a slight chance of precipitation.